Is there a way to fully customize the MP character? I think I'm right in assuming that the m_mp_freemode1 is the character model, but you can't seem to customize the clothes, hair color or anything. Can you teleport yourself to all the spaceship parts and letters? That would be fan-f*cking-tastic! Should do blackbmx, it's on the other teleport menu. Regarding online, this trainer won't work online and I guess the safest thing to do is the move it out of the folder when you go online, but that might not be necessary. Customizing the online character is not possible, although I did see the director mode enables it, so there might be a way, probably need more investigation. I hesitated a bit before writing that, but I guess I have nothing to lose and the people on here seem pretty cool as well so I figured I I'd have no problem. That might actually be hard to believe, but I can assure you that what I'm going to say next is 100% true. I'm a visually impaired person and I've been playing GTA since GTA IV came out, and I've really enjoyed the game because of your trainer. I've had help from a sighted person writing all the menus in a text file in order so I can navigate them easily since my screen reader is not compatible with the trainer unfortunately. My question is this: Is it possible to allow a feature in your GTA V trainer where the cursor would not wrap around? For example, if I'm on the first option on the top and I press 8, it won't go to the last option and vice versa, same for left or right? I know that would not help others, but if you could turn that feature on or off I know it would really help me. 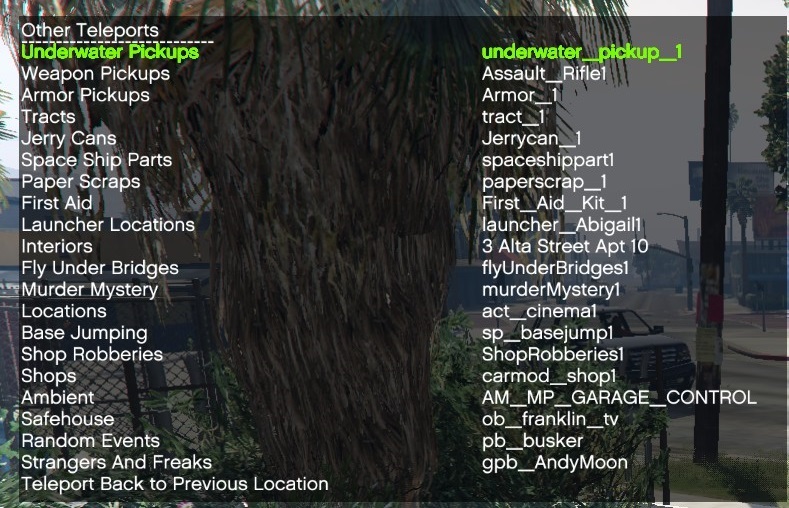 Also, would it be possible to use the same sound in GTA V when you scroll through the options so I know I'm actually changing something? I believe that was in the first trainer by Alexander Blade. DefaultRadioEnable=0 is what it should be set to in the ini, I have updated the download. Alternatively just set it in the ini yourself. I can't open the trainer? It is F3 and F4 right? BTW, What are driving styles in the ini file? is it like, for cops/gangs/enforcers/normal mobs? I tried to change the style but the bug remained anyway. I figured out the Car spawn save and respawn menu and sorry for posting so much, I get excited over new thing's easily, and Thanks for this Trainer it adds more realism to the game, like the shoulder duffle bag, you can finally have a place for all your weapons and and money you stole well clobbering pedestrians and not feel like you have a swiss army knife capacity storage in your pocket!.. The game didn't crash, but the trainer didn't work anymore. Just have one question,how do i change the font's size ? And is it possible to make a shortcut to add our favorite options/spawn's in it ? like the shortcut name would be "favorites" and inside it we'll have "Rapid GT,God mode,Never Wanted" etc...without having to go through all the options. When I try to launch my modded version of the game, it says "The game was not launched via the Steam Client". Will I have to mod the original version of the game, or how can I launch it? Ladies and gentlemen, a new era has begun! It seems there's some few customization for police cars missing will more options such as customization will be added in the next future updates? Can we save trainer settings? I couldn't find this option. Not yet, there wasn't enough time to add those, but that will be one of the things I will add once I resume development. For now use the ini file, there are quite a few settings that can be set in the ini. I've asked a question on the first page and it went unanswered. I hate being annoying, but just in case the question was missed: will there be an option to type in the name of the animation you want, just like one can type the name of a character model? The current browsing system is great for exploration, but finding one specific animation again is very difficult given their sheer number. Oh, and a small bug report: spawned peds are impervious to headshots. Does the same amount of damage as shooting them anywhere else. The search anim thing is something that will be considered if time permits. MrDazza, is 1.24 supported by scripthook ? If so it would probably run. BTW dude, you should try to find a way for following drivers to drive in formation/convoy, right now if more than one driver follows the player, either you're lucky and they stick in line (very closely though) or they just drive at the same position, fighting their place to be the one following you first. Thanks for the reply! And yeah, I figured it was meant for bodyguards, but it also affects spawned peds of all kinds. If someone wants to spawn a bunch of hostile peds, place them around a location and start a firefight, the inability to kill instantly with a headshot may be a dealbreaker (not for me, I'm focused on machinima and can tweak gun damage values to achieve the wanted effect, but I thought it was worth mentioning anyway). I am not promising anything in terms of time, but will add it if time permits. Can you add an option to disable the selected time after a savegame is loaded? I mean, in the .ini, say it's 12:06. So everytime after loading the savegame, game will change the clock to 12:06 and that's a little bit useless feature.